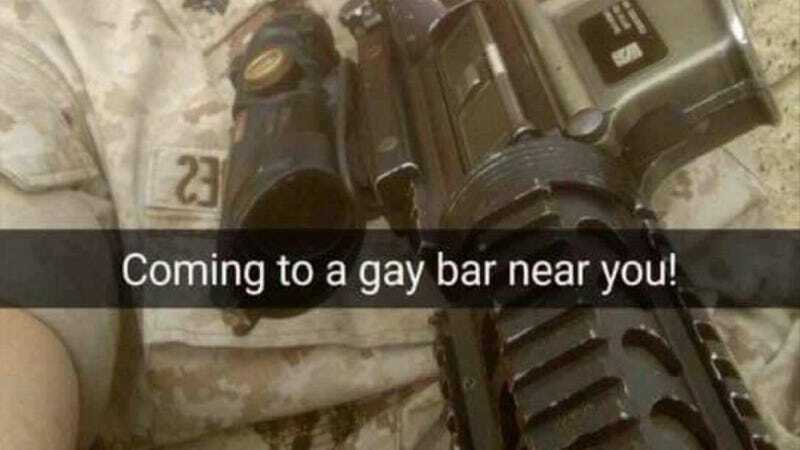 Two marines are under investigation for uploading a photo to social media in which they allegedly threatened to attack gay bars—all less than a week after the shooting at the Pulse gay nightclub in Orlando, which has been deemed the worst mass shooting by a single gunman in U.S. history. The Marine Corp members reportedly responsible for the post belong to the I Marine Expenditionary Force (I MEF), which is headquartered at Camp Pendleton in San Diego County. The photo, which was posted on the Camp MENdleton resale Facebook group—a closed group for male marines with an amassed 25,000 members—features an unnamed male corporal holding a military rifle with his finger poised on the trigger. The post also promised that “Orlando was long overdue,” and that San Diego, the city near where the suspects were based, was “next,” according to The Marine Corps Times. I MEF spokesperson Lt. Thomas Gray told the press that both the person featured in the photo and the person who posted the photo have since been identified. The founder of the Facebook group, Michael Moss, also publicly disparaged the photo. “We do not tolerate hate speech,” Moss, who was also responsible for removing the post, told the press. Unfortunately, this incident inherently tied to the Orlando shooting is not a standalone occurrence: on Monday night, a man was arrested in Brooklyn’s Bushwick neighborhood after he threatened to perpetrate an “Orlando-style” shooting outside of the gay bar Happy Fun Hideaway. He also screamed that he would “get his 50 just like Orlando,” referring to the initial approximated number of Pulse casualties.